The sculpture project BLACK BOX encompasses more than just a three dimensional project. Although the eventual sculpture will be the most tangible aspect, it will be the carrier of a larger whole. A black box is a capsule that is used in aerospace for the registration of flight information and is built to endure great forces in case of a crash. Chris Peterson works mainly with the material granite, a volcanic stone that is sheer indestructible. Why not make black boxes that could display a variety of poetry, storytelling, music in a specific region or country? Chris came up with the idea to create capsules, cocoon shape sculptures that would cherish more than just the visual aspects. It could be a carrier of that what isn’t visual, the spoken word. By incorporating technology into the sculpture, the public would be allowed to download a variety of spoken word on their smartphones when being close to the sculpture. Whether this would be poetry, storytelling or music, the possibilities are endless. The sculpture and its vocal content could appeal to a variety of people from young to old, from art lovers to those who aren’t that familiar with art. The sculpture would be made of black granite and have a high polished finish. The shape would be box or cocoon like. Formed as if the shape was exposed to great vibrations. When looking at an object from afar in great heat, the heat waves deform the contours of it. In the case of the Black Boxes, the vocal vibrations deform the visual carrier. 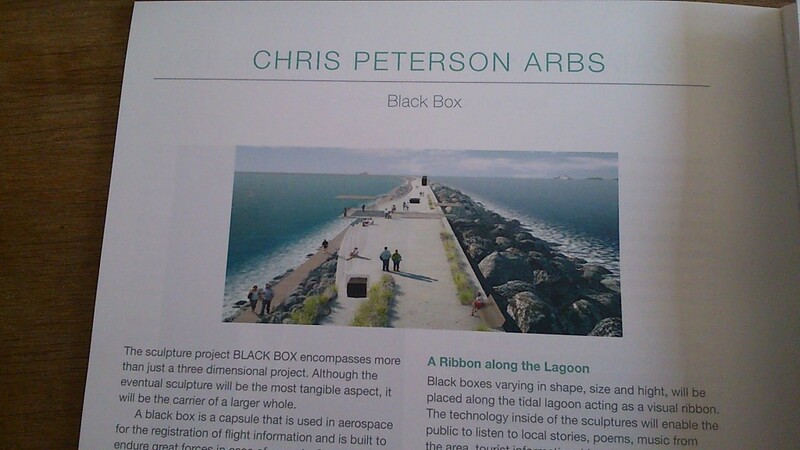 The technology inside of the sculpture will enable the public to listen to local stories, poems, music from the area. Additional tourist information, background information on buildings, urban or natural space, could be supplied as well. Besides these options, the platform could offer a meaningful tool for educational purposes. The sculpture could not only add to the environment in terms of visual and vocal content. The technology could also allow the public to actively share their stories and experiences and contribute to the history of a particular space or building. This sculpture would become an archive of experiences.